We partnered with the State Library of North Carolina to offer our "Fail Better: Skill Toys for Tweens & Teens" training in three different regions of the state. Youth services librarians looking for new ways to connect with teens in their community attended and enjoyed a day of learning, play, and reflection. As they stepped outside their comfort zones and challenged themselves to practice new skills, we provided them with strategies to reframe dropping and get comfortable with the messy middle. Strategies they can practice as they design new programs (which don't always go smoothly the first time) as well as introduce to teens to help build resilience. We've now conducted this train-the-trainer workshop in 5 states and would love to expand it to more library systems. Through our partnership with each state, skill toy kits are made available for libraries to borrow so they can turn what they've learned into on-going programming. We had a number of NC libraries so excited about skill toys by the end of the day long training that they ordered their own kits. Some of the ways in which libraries have or plan to utilize skill toys include school visits to promote library programs, stress/study breaks for teens, STEAM programs, ice breakers for staff meetings, and inter-generational play sessions to get the whole family involved. 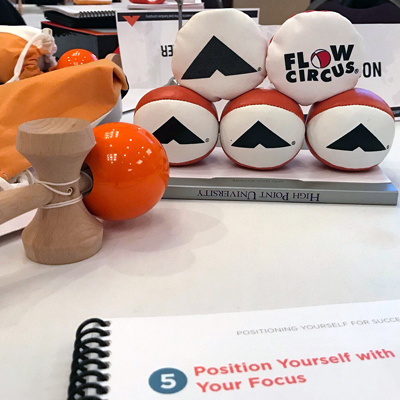 Last month, Flow Circus returned to the CAI Human Resource Management Conference in a big way - with flop balls, of course! Day 2 started with a custom CAI branded flop ball on every seat and Paul kicking off the morning with an energetic demo for the whole group. The organizers of the event smartly scheduled our breakout session "Don't Sweat the Flops" for after lunch. There's nothing that can challenge post-meal sleepiness on the second day of a conference like our interactive session. 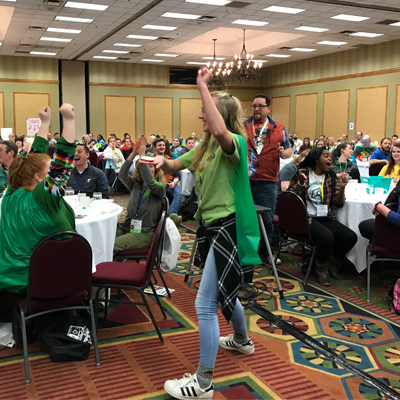 As Colleen Cunningham, conference organizer and VP of Learning Services at CAI, observed, "Your session was a great energy boost, something unique and the folks in your break out session truly loved it! Always great to work with you---I appreciate your professionalism and great communication." Throughout the course of the day, we also had an invigoration station set up to engage attendees in between sessions with a refreshing mental and physical break. In addition to a variety of skill toys, we ran a flop ball stack flipping contest. Many people came back to the table several times to see if they still held the record or needed to up their game. The record setter for the day with a total of 7 flop balls successfully flipped at once was Kara Norris, Senior Human Resources Technician, City of Rocky Mount. She won a set of six additional flop balls. When I contacted her to let her know she won, she replied "My team and I are so addicted to flopping! We took time yesterday to flop and we'll be taking another flop break this afternoon at 4pm! The set of 6 flop balls will definitely come in handy for our flop sessions! I'm ready to get them so I can try to beat my record! We enjoyed meeting y'all and stopping by to see you throughout the day. We definitely enjoyed your breakout session. It was a lot of fun and a lot of good information!" We love to hear that our impact lasted well beyond the event. 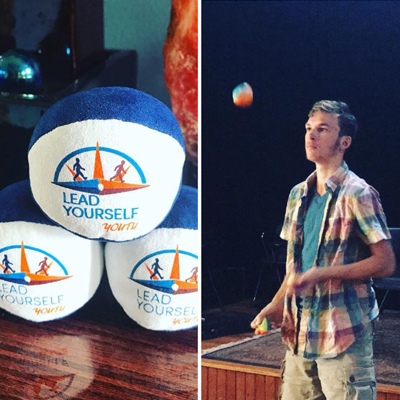 Last week, we returned to the YMCA Campfire Conference in Black Mountain, NC to engage 300 camp professionals from across the Southeast with flop balls. 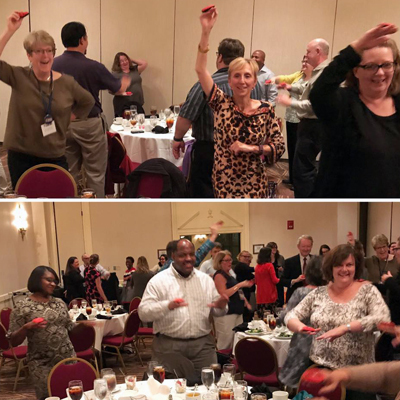 This year, we kicked of the conference with a flop ball energizer before the morning keynote. It woke up the room and gave this active group a chance to play and move before sitting for an hour. The keynote speaker gave a powerful talk and the audience seemed more primed for receiving her message. In addition to our energizer and educational break out session, we had a flop ball station in the lobby of the main gathering area. Throughout the two days, we ran a flop stack flipping contest. We had several people coming by to see how high the record had risen and in many cases to try again in order to improve their own personal record. We didn't get too picky. As you can see in this picture, the flop balls needed to land on the hand, but not necessarily in a clean stack to count. She landed 6, but the winner ended up successfully flipping a stack of 9 flop balls! The most exciting part of the conference for us came from our conversations with camps that ordered flop balls at last year's conference to use during summer of 2018. We heard about how flop balls were used in staff training, planned skill building activities, as well as for free play during down times. Conversations also generated new ideas like using them as an incentive for kids that take a long time getting changed after swimming lessons or as a tool for teens to teach younger campers. As you can see in this video, the folks at Camp Ironwood and Kingsport YMCA in Tennessee have become big flop ball fans. We're excited to see how flop balls get used by more camps in 2019. In November, we partnered with NC State's Institute for Advanced Analytics which offers a year long graduate level program for high performing students. 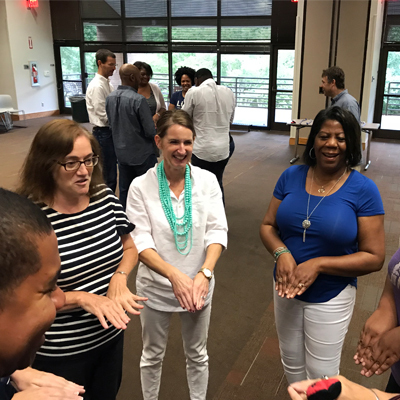 As the intensity and stress of the program increased, we introduced them to mindful strategies for reframing stress and engaging in the learning process in a new way. 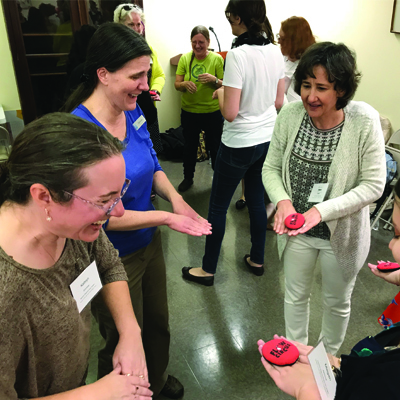 The group may have initially wondered why the program organizers chose to "waste their time" with a silly activity, but they quickly embraced the flop ball exercises and understood the value of pausing to reflect on process. Looking forward to continuing this partnership in 2019. Leadership has been and will continue to be the subject of books, discussions, and workshops. A variety of theories exist - just do a search for "qualities of a strong leader" and you'll get plenty of new reading material. The core belief for our programs centers on the importance of building self-awareness and empathy by continually stepping outside one's comfort zone. Leader = learner. This fall, we had the opportunity to work with two local teen leadership programs - one offered by the Wake Forest area Chamber of Commerce and the other by the Rolesville Chamber of Commerce. Both programs "aim to develop a group of informed, committed and competent youth motivated to learn more about our community, to assume leadership roles in our schools, and to become more involved in our civic, cultural, economic development, and philanthropic organizations and groups." In both cases, we kicked off their programs with flop ball exercises to challenge them individually and in teams. Debriefing about the experience allowed them to gain new insights about themselves and their fellow future leaders. We look forward to working with both organizations and future classes of these programs. "Flow Circus is a great company to work with. Their training style is fun and interactive. They allow you to develop and identify your leadership style while building your confidence along the way. Their training style allow our students to shift the way they reflect on themselves and the way they see the world." Dawn Daria, Flow Circus Chief Education Officer, has been lending her expertise to the Wake Forest Area Chamber of Commerce for over a decade. Her engagement with the Chamber started when she enrolled in the Leadership Wake Forest (LWF) program in 2005 - even before she joined Flow Circus full time. 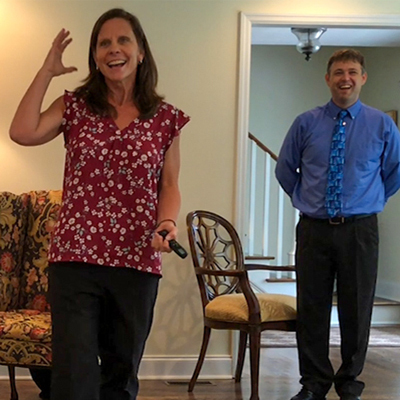 A new homeowner in the town, the program connected her to the community and opened her eyes to the important role that the Chamber plays in supporting local businesses. Dawn’s teaching experience made her a perfect fit for joining the planning team for LWF. For the next several years, she coordinated the adult program and then worked with a team of area professionals to adapt the curriculum for local high school students. The Youth LWF program has been successfully connecting teens to the town's history, government, and business community with experiential learning sessions and has been recognized by other area chambers for its impact on youth in the community. After receiving the Woman Business Owner Award in 2015, Dawn was also recruited to help plan speakers and events for the Women's Business Alliance. 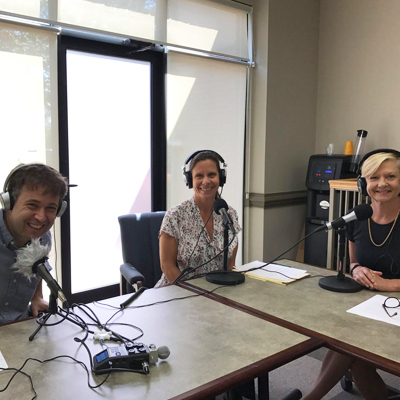 In an effort to promote thoughtful conversations and connections among members, Chamber president Ann Welton reached out to Dawn last year for ideas. With the help of a few other business leaders, Dawn created Leadership Lit. The group meets monthly to discuss books and TED talks related to business and leadership. Ann has been thrilled with the fact that these sessions have attracted members that don't traditionally attend other Chamber events. Participating in and helping to cultivate these various communities within the Chamber has provided Dawn with invaluable connections and support over the years. She's is happy to accept her new position serving on the Board of Directors. Congratulations Dawn Daria. All that know her have no doubt that she’s going to make a positive impact on the leadership team and the wider business community. What happens when you bring together multiple generations of a family owned company? Inter-generational play & engagement if we're involved, of course. 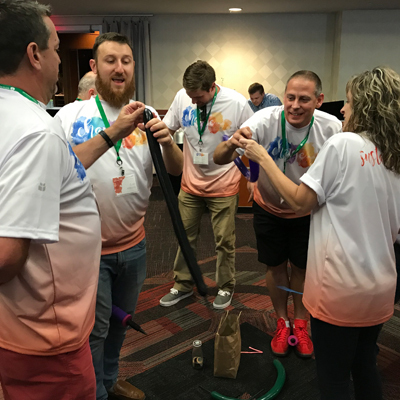 Our interactive keynote got the group connecting & growing - together. The client asked us to focus on themes affecting the multi-generational group that ranged in age from 21-93 years old such as honoring and appreciating the way things have been done that led to the company's growth while staying open to new ideas. "Paul and Dawn were lovely and did an amazing job at our Annual Meeting. They were prompt, professional, delivered an educational and fun presentation, and were well received by our audience. Paul and Dawn were able to personalize their FLOP Ball presentation to the specific themes we wanted to introduce our group to and the flop balls themselves were a fun and versatile “prop” to drive the presentation home. Our group really loved having the balls to take home and play with!" - Caroline Hamilton, Communications Coordinator, Comporium, Inc.
As you can see in this image of us, we had fun, too. We recently had the opportunity to partner with Lead Yourself Youth, an organization founded by CEO and leadership consultant, Andrea Bordenca. Seeing the effectiveness of her somatic coaching work with her growing team at DescoMed, Andrea saw a need for these same services and skills among the teens in her community. LYY offers programs to help youth integrate emotional literacy, teamwork, and somatic/body awareness into conversations about stress and the ups & downs of learning to learn, both in school & in life. One of her initial offerings has been a Mentorship Training in which she empowered teens to take a leadership role in offering skill-based workshops based on their own interests such as sewing and juggling. Jesse, the teen juggling instructor, got initial lessons and follow up coaching from us as he worked through the challenges of leading a diverse group of learners. He should be very proud of inspiring his group of middle school students to try juggling, put time into practicing even when it got messy, and celebrate the success that they experienced. One of the middle school students had so much fun he shared a new trick that he had figured out with Jesse on the last day. Congrats to Andrea & Jesse for the impact that they're making in their community. 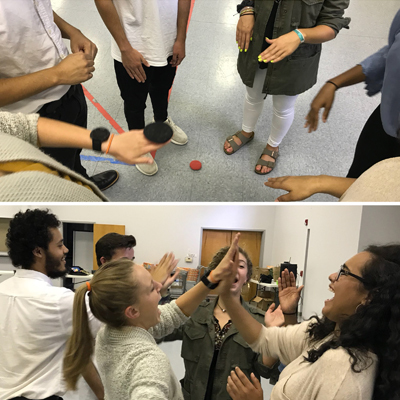 Earlier this week, the team at Capital Area Workforce Development kicked-off their annual two day staff retreat by flopping - with flop balls, of course. We introduced them to basic moves and then let them get creative with individual tricks and partner passing. We suggested that pairs work up to passing two at a time, but one team really stepped it up trying to pass four flop balls in their pattern! As you can see in this image, the team circled up ready to receive while also offering support and cheer leading as they worked toward their goal. The half-day workshop also involved conversations around mindful learning and enjoying the process while working toward achieving individual and team goals. 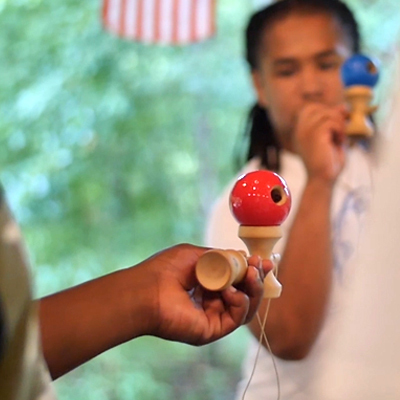 Skill toys such as spinning plates and kendama helped to reinforce these ideas. The spinning plate challenge at the end is always a fun way to see how groups can strategize and innovate together. 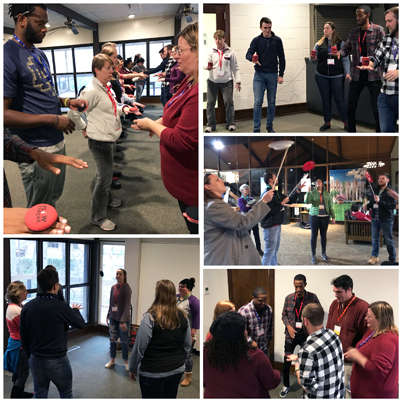 This past weekend we participated in the YMCA of Rowan County Camp Staff Day which brought together approximately 130 summer staff from several different camps in the area. The planning team for the event had decided to implement a mini-conference style day with all counselors being in attendance for some parts and then attending breakout sessions the counselors selected for themselves. We kicked off the day with an interactive keynote for the whole group using the flop ball and our strategies for helping campers through the struggle that sometimes comes with learning something new. We then ran two break out sessions introducing skill toys such as the flower sticks seen in this image. The skill toys allowed the counselors to further practice getting comfortable with the messiness of learning new skills as well as get new programming ideas. As part of the camp staff day package, the camp received a skill toy kit that will provide both passive and active programs throughout the summer. We look forward to hearing what new ideas they come up with for using flop balls and other skill toys with campers. This past weekend we conducted a workshop as part of the USO of North Carolina's Family Reset program. The Reset programs focus on giving all members of military families the hands-on training and tools to better cope with the pressures and challenges associated with the military lifestyle. We're honored to have been involved with Reset programs since their creation in 2015. Our workshop engaged families of all ages learning new skills like juggling, spinning plates and flop ball. We focused on mindful play - paying attention to the process and what we can learn about ourselves and each other. Needless to say the room filled with lots of laughter, moments of connection, and people surprising themselves with what they were able to accomplish with the right mindset. 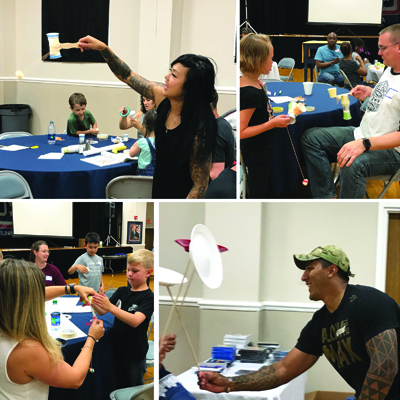 We're looking forward to upcoming Family Reset programs later this summer and continuing our partnership with the USO of NC. Last week, we traveled to Chicago to participate in the American Camp Association's Mid States Conference for the first time. They invited us to do a short energizer to give attendees a boost after lunch and before the keynote speaker. As soon as Paul introduced the Flop Ball, the energy shifted. Once on their feet, they tossed and flipped with big smiles on their faces. Many naturally tried passing with someone nearby. Informal connections and renewed focus for the rest of the day - objectives achieved! Knowing that camp professionals can be competitive, we wrapped up the experience with a quick competition. In this image, the woman celebrating is one of the few people left standing and still in the running. I love the expressions of the people at the tables near her. Even though they had already been eliminated, they still couldn't help but be excited for the success of their peers. As you can tell if you look back at past news posts, we're super excited about the Flop Ball for many reasons. We have added it to our interactive keynotes, team building workshops, and can customize them with an organization's logo. Summer camps are excited, too. 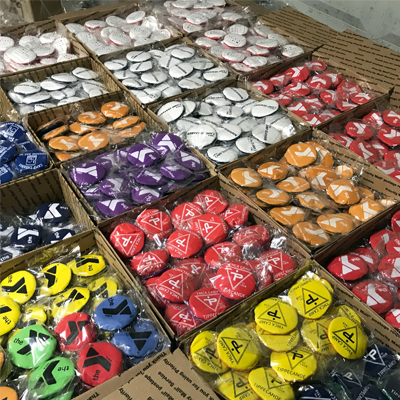 Earlier this year, we attended the YMCA Campfire Conference to introduce Flop Ball and take custom wholesale orders. The latest Flop Ball order landed last week. It felt like Christmas morning as we received the delivery, opened boxes, and saw all of the different designs for the first time. What a cool array of color choices and logos.They have been boxed and sent to camps around the Southeast. This shipment also included our first order with the new Flop Ball logo on it and we are thrilled with how it looks. We can't wait to travel to Chicago soon for the ACA Mid States Conference to introduce this new skill to a new region. We hope to get more even more campers flopping this summer. More videos and flop games will be posted at FlopBall.com soon. For us, February means International Toy Fair in NYC. We've been going for the past 5 years to see our skill toy vendors, see what new skill toys we might want to add to our programs and kits, and of course to just play. 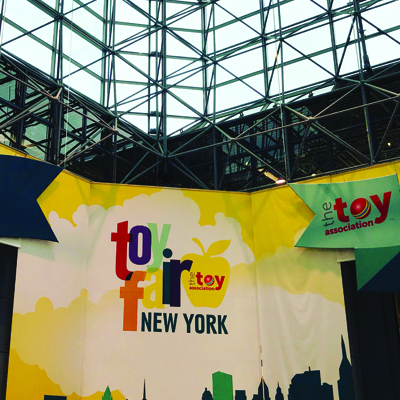 The Javits Center in Manhattan has over 800,000 square feet of exhibit space and I think Toy Fair filled all of it with everything from stuffed animals to action figures to skill toys. Paul managed to get a ukulele lesson, juggle with a hooper, and get beat (by me) testing out new games being showcased. Our favorite exhibit took us down memory lane. Ebay's display of toys and games through the decades included some of our favorites including Simon, Lite Brite, Spirograph, and the Evel Knievel doll. We also attended a workshop by Amazon about smart packaging for e-commerce. Because e-commerce items aren't sitting on a shelf trying to get a buyers attention (photos on the website do that), packaging can be simpler and take up less space. As a result, packaging waste is reduced and more items can be packed in one truck. Can't wait to see what will be new next year. If you've attended one of our keynotes, workshops, or trainings in the past year, you've flopped. And that's a good thing. 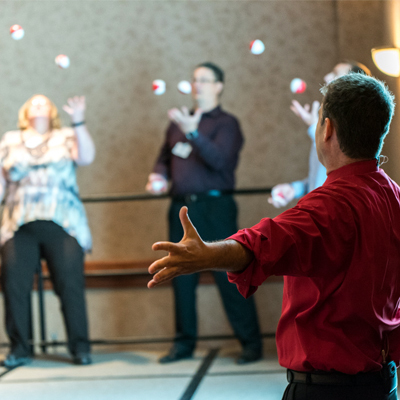 During our interactive sessions, we like to get people up and moving, but juggling balls proved problematic. When dropped (which happens to all of us) they roll away and into the next row of people. We started using a flat bean bag instead because it just flops in place. It's not a new skill toy - many skill toys when most have been around for hundreds or even thousands of years. What is new is calling it a Flop Ball. The name describes what it does, and the fact that it's a tool to help redefine failure. When you hear the word flop you might think of a movie or Broadway play that didn't bring in the expected revenue. Instead, we want to make flopping a playful part of the learning process. By paying attention to what's happening and making adjustments, we can grow and have fun. We love the new logo created by KLP Designs and wanted to share it with you. The design and font capture the playfulness while showing how it works. Watch Flop Ball instructional videos to see how simple, yet challenging it can be. When we went to college, certain times of year like mid-terms and finals created some stress. But today, students are feeling a ton of it, all year long. 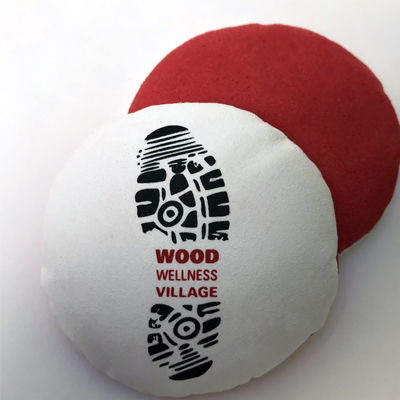 Students living in NC State's Wood Wellness Village have chosen to focus on well-being and live with fellow students doing the same. Last weekend, we ran a half-day workshop introducing them to new tools for unwinding, building mindfulness, and practicing resilience. First up - flop ball (check out how cool their logo looks on it). First they got comfortable with dropping and then we challenged them with individual, partner, and group exercises. Laughter, cheers, and high-fives filled the room. They then learned to play with a variety of skill toys that they now have available to them in the dorm. All play a little differently and everyone had a favorite. 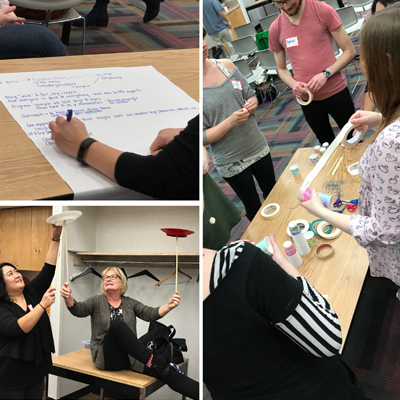 All of these skill toys and challenges provided an opportunity to reflect on how they approached the "stress" of learning something new and re-frame it as just a fun, new challenge. It also allowed the students to connect with each other in a new way at this halfway point in the year. It made me really appreciate how play can reduce stress and improve resiliency. Realized that "failing" is only a path to building greater success. It allowed me to spend time with the others while having fun! I came to understand more fully that relaxing and having fun is very important to maintaining a state of overall physical, mental, and emotional state of wellness. But it was the comments like, "I really enjoyed being able to just relax and play" and "reconnecting with my just for fun roots" and "realizing play is a form of self-care" and "I need to relax more" that made concerned for about the current conditions for college students. We're happy to have been able to have an impact on this group, but know that there's more work to be done. Research indicates that resilience, grit, and growth mindset play a critical role in student success, but how can we help empower tweens/teens with these skills? 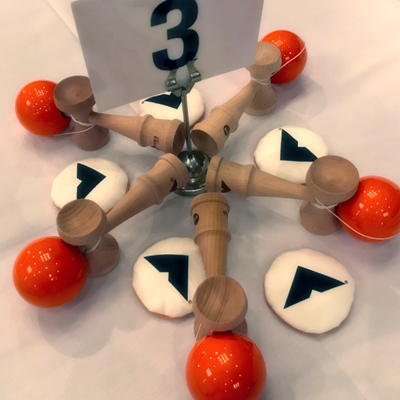 We recently conducted a full day training for librarians from across the state of New Jersey in order to introduce them to skill toys - playful, unplugged tools for encouraging tweens/teens to shift mindset and see “failure” as an opportunity for learning and growth. The training included a number of skill toy kits so that the participants could apply what they learned and offer creative programming for years to come. 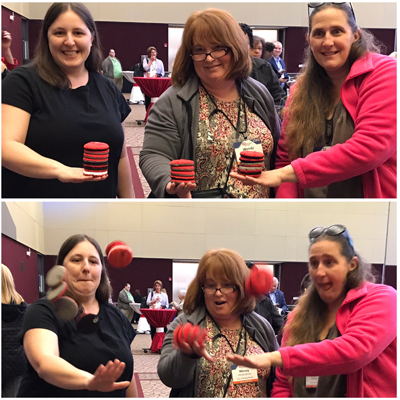 The first half of the day focused on tween/teen librarians getting comfortable with skill toys like spinning plates, yo-yo, and kendama. No one had to be an expert in the skills by the end of the day because we modeled how to take a mindful approach to dropping, learning, and facilitating. 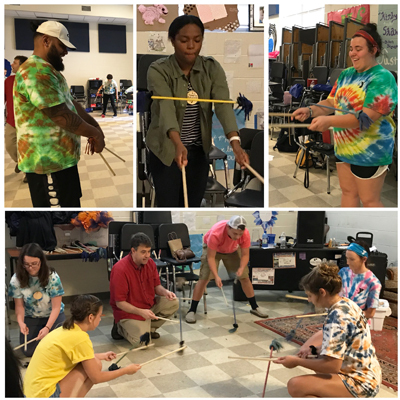 The second half of the day took participants through a number of challenges and exercises for connecting skill toys to STEAM, Summer Reading Program, and other common themes. As NJ State Library Youth Services Consultant Sharon Rawlins described: "This was a fun and instructive workshop that allowed the teen librarians to work individually and in groups to learn to manipulate skill toys to use in teen programming. We celebrated when we mastered the skills and laughed when we messed up. We realized it's okay to fail, as long as we keep trying - a valuable lesson for teens to learn as well." - Thanks again for creating such a supportive atmosphere that day. I left feeling great about the things I could do and determined about the things that I couldn't do (yet)! - Aside from all of the awesome programming ideas, it definitely strengthened my confidence in building up the teens and taught me to tackle programming in unexpected ways. - This is a fresh idea to introduce to my teens. I do a lot of crafts but this is very physical. Great to get energy out after school! - I'm planning more programs that teach teens resilience and now have learned a bunch of fun ways to teach it. - We celebrated when we mastered the skills and laughed when we messed up. We realized it's okay to fail, as long as we keep trying - a valuable lesson for teens to learn as well. We look forward to staying connected and hearing about what new ideas they come up with for using the kits. Read more about it on the NJ State Library blog. Happy 2018! Around the holidays, we made a decision to practice what we promote and take a break. No new blog content and very limited social media posting gave us time to be present and playful during family celebrations, reflect on 2017, and reconnect with why we do the work we do. Taking a break challenged me at first because I enjoy reading, writing, and creating content, but it distracted me during family events. After a few days, I eventually turned that creative energy toward our holiday festivities. We then took the first week of the new year to focus on goals and strategy for 2018. 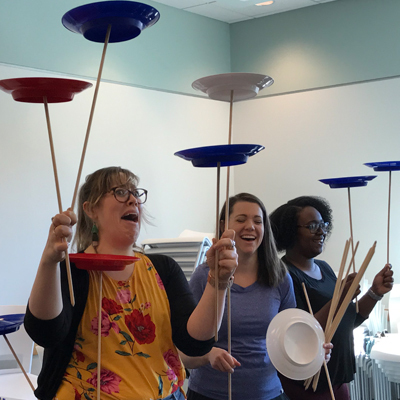 During one of our strategic planning meetings, we came up with a clearer way to explain why we use juggling and skill toys in our programs: to build connections through mindful play and learning. 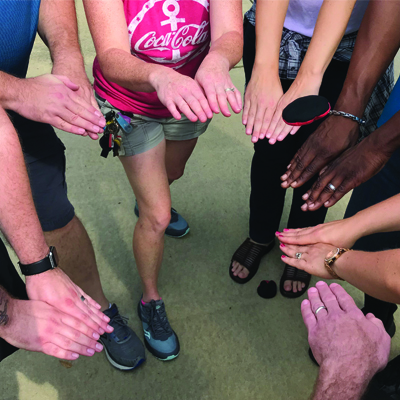 Stronger connections with self through awareness and reflection, stronger connections with colleagues through shared struggle and success, and stronger connections to abstract ideas through experiential learning exercises. Explaining what we do has been challenging for us in the past (and we haven't always been on the same page), but this time it flowed easily. I believe that's largely because we scheduled the planning retreat immediately following our break and came to it fresh. Where I always struggle is shifting back into the rhythm after a lull. 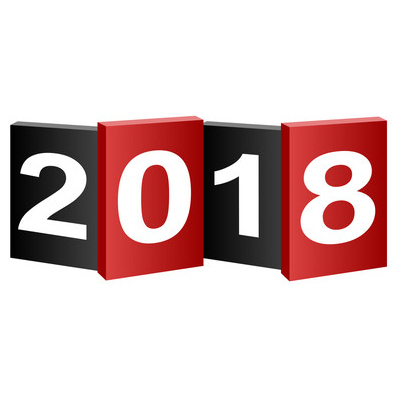 I'm a few weeks into 2018 and just posting to the blog for the first time. And I almost put it off another day, but realized I just needed to start writing - rusty or not. My one takeaway from the experience: take the break (it has been valuable), but anticipate that the transition back may not be easy. Next time, I will set writing as the first thing I do after a break so I don't keep putting it off and let busy work get in the way. Always testing and learning from what works and what doesn't. What helps you transition back after a break? 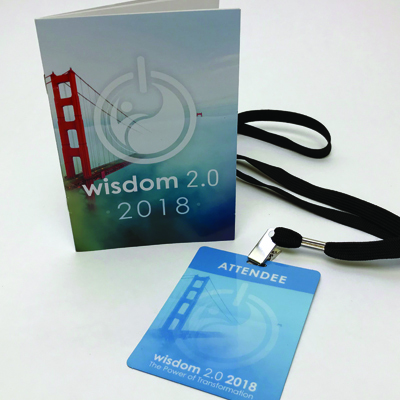 We're excited to attend the Wisdom 2.0 Conference in February which focuses on how to "not only live connected to one another through technology, but to do so in ways that are beneficial to our own well-being, effective in our work, and useful to the world." In other words, how do we take care of ourselves in this fast-paced, information overload, 24/7 world. We know that play breaks work as a great tool for connecting to our bodies, our mindsets, and others. Of course, we want to share that other conference attendees so decided to submit an entry to present on their People's Stage. In the submission video below, we explain how our programs and skill toys can help communicate the power of mindfulness and mindset to skeptical colleagues and friends. 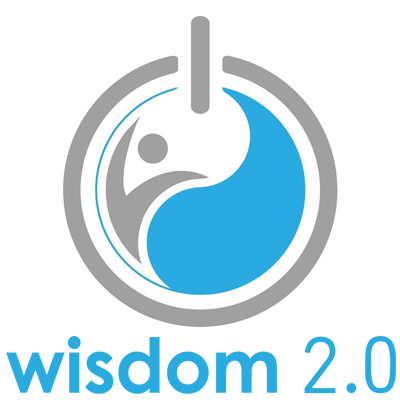 If you have a few moments visit, wisdom2contest.com and vote for our video (5th row down). You don't have to be attending the conference to vote at this point in the selection process. Thank you. December is here. As many of you are thinking about what new toys & games to put under your tree this month, we thought we’d go back in time! 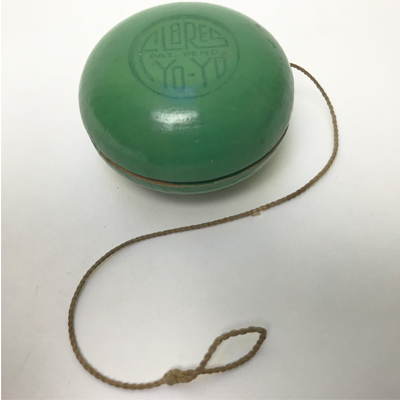 Each week we will post a vintage skill toy from the Flow Circus Skill Toy Museum. 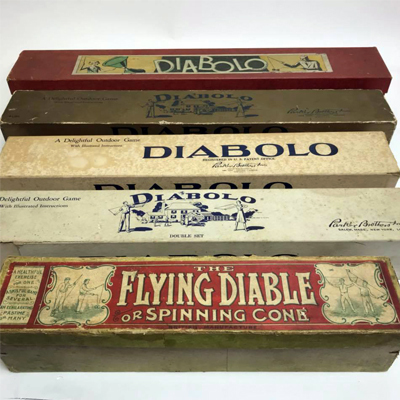 This week's selection are a variety of vintage diabolos from the late 1800s & early 1900s (England & US). Notice that event Parker Brothers wanted to capitalize on the new craze for adults (you can see their name on a few of the boxes). You'll also note in the box image that adults are tossing and catching the diabolo as a "delightful outdoor game." The diabolos in the image below are made from different materials. One came with the sticks and string in a specially designed carrying case. Very stylish! 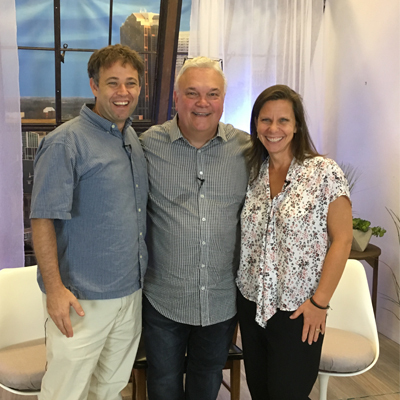 Flow Circus featured on "Loving Life with Dr. Weir"
Flow Circus recently visited Uptone Pictures studio for a guest appearance on "Loving Life with Dr. Weir." A chiropractor with a playful personality, Dr. Weir made it fun to be on set. We loved having the opportunity to talk more about what Flow Circus offers and why. We talked, flopped, dropped, and reflected on the learning process. Dr. Weir had fun with our juggling lesson, but as you can see from the outtakes at the end, we may need to give him a few more lessons! Flop Ball - our favorite new skill toy! 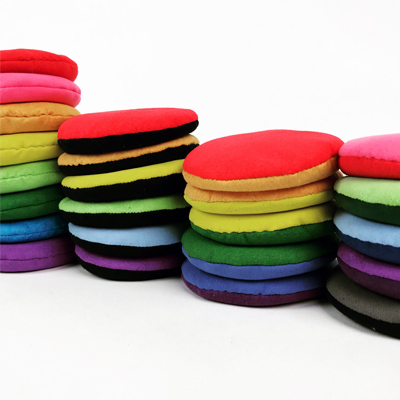 We now have a variety of colors available at FlopBall.com in packs of 2 or 6. Flop ball is a specially designed bean bag that uses the back of one’s hand to turn the whole experience of tossing and catching upside down. First master the four basic flips; front, back, in and out (see what we mean by watching videos). 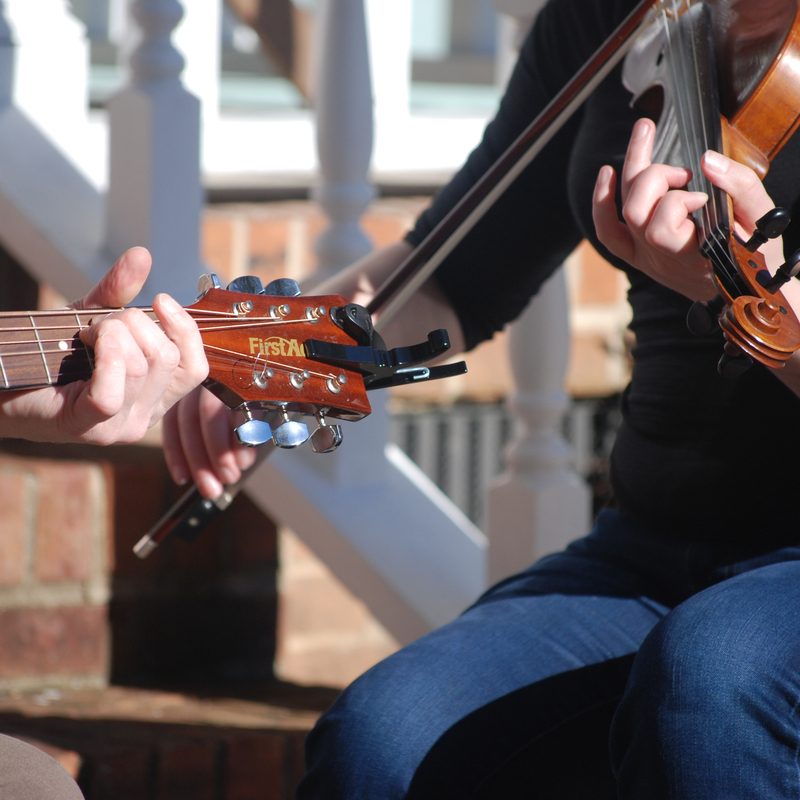 Then attempt the surprisingly challenging flats, flops, and various swaps. After a bit of practice, you're ready to move on to partner and group challenges that are sure to leave everyone recharged and refreshed. Such a simple skill and toy, yet it will keep your family, friends, and co-workers engaged for hours. 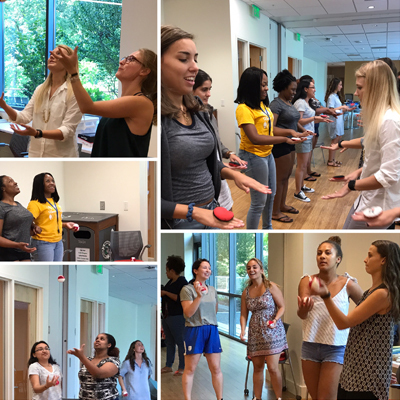 Last month, we introduced Duke Wellness interns to new experiential tools for engaging fellow students in conversations about well-being, mindfulness, stress, & resilience. 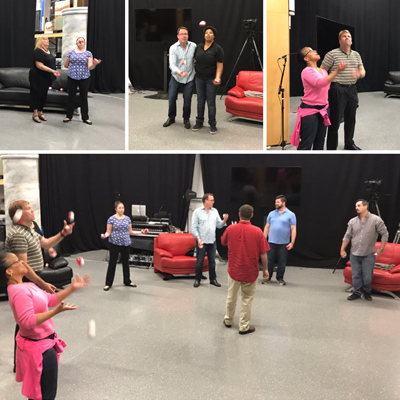 The half-day training included individual and team juggling and skill toy play coupled with reflection about struggling and succeeding. Groups then brainstormed ways to implement skill toys into on-going DuWell programs. The training package included a skill toy kit with close to 50 skill toys and a follow up coaching visit with the students later this fall to refresh skills, debrief on how programs have been going, and brainstorm new applications for the kit. We can't wait to check back in with them to see how they've put skill toys into practice for themselves and other students campus-wide. Last month, Paul delivered an interactive keynote for the Charter Communications Human Resources team to help them celebrate the one year anniversary of their merger with Time Warner Cable. The organizers asked Paul to emphasize the importance of collaboration and embracing change with a positive open mindset. Of course, juggling provided a perfect tool for doing just that. Participants stood up to do both solo and partner activities. A few even went on stage to show off their new skills. Celebratory energy with a memorable message - just what the client wanted. This week, Paul and I sat down with Dr. Curtis Rogers, Communications Director at the South Carolina State Library. As you can tell from the podcast, we love to talk about juggling, skill toys, learning, and the importance of play. Listen and discover where the Flow Circus name comes from and the impact juggling has had on us personally as well as others we have taught. Hope we inspire you to pick up a set of juggling balls or find some other way to step out of your comfort zone today. Take a play break - you'll feel better! 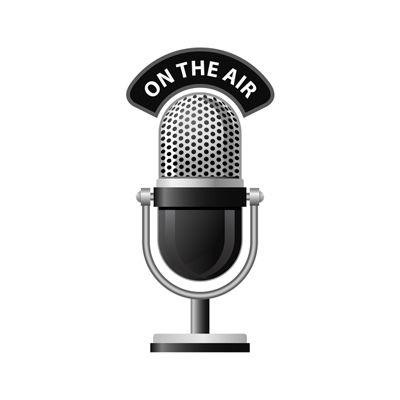 Visit Library Voices SC to listen to the podcast. We're episode #24. Keep practicing - we may return to see how your skills have developed. 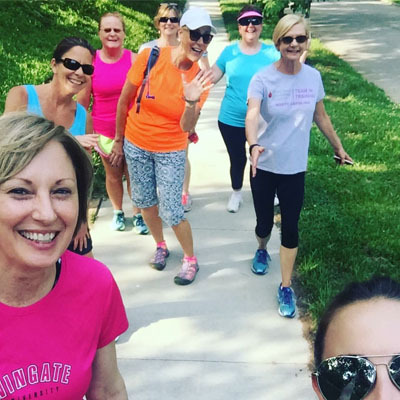 Our local Chamber of Commerce, town government, and YMCA are partnering to get residents moving with “Walking Wednesdays in Wake Forest.” Of course, I had to join the “sweat working” team at the Chamber. This photo captures our team a little more than halfway through our 2 mile walk through the historic district. Such a fun way to reconnect with neighbors and meet a few new ones. Come join us next week - the more the merrier! The program runs through the end of August and team steps get pooled with a goal of having enough cumulative steps to get to Alaska! More information on the Town of Wake Forest website. 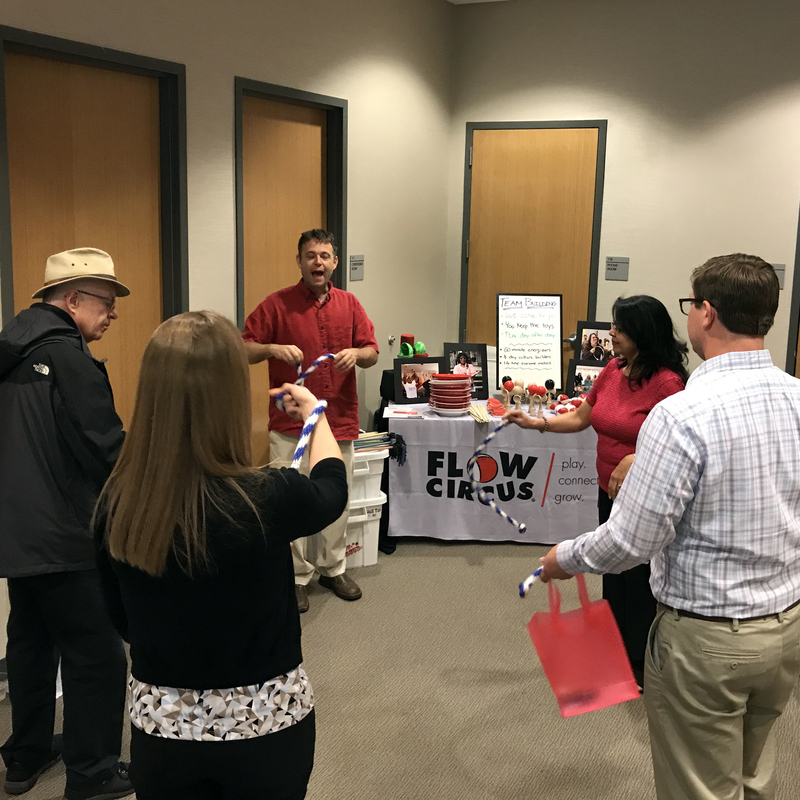 Do you have a Flow Circus Skill Toy Kit at your company, college, camp, or library? What questions do you have about skill toys? 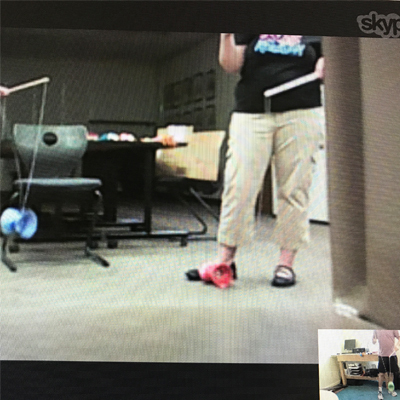 Last week, we had a Skill Toy Skype coaching session with teen librarians in Gaston County, NC. We brainstormed ideas for their upcoming Skill Toy Relay program, reviewed instruction for the diabolo, and demonstrated getting the top started. We enjoyed the session so much that we want to do more! June 6-7 are open for us so if anyone wants to schedule a Skype session (or google hangout) with us and members of your team, email dawn@flowcircus.com with your preferred time on one of these dates. We'll try to fit in as many as we can. 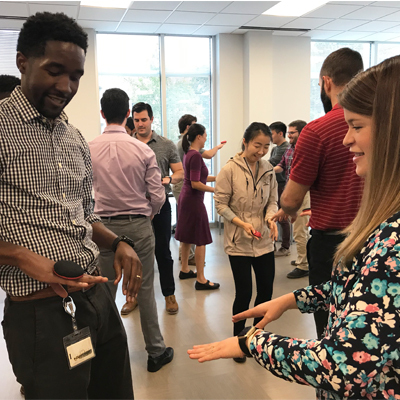 Employees at RTI International learned new skills while refreshing mind and body at our Invigoration Station yesterday. As you might imagine, we don’t have the traditional health fair booth - people expect to see massage therapists and chiropractors, but not skill toys! We love watching the initial reactions to our interactive station from “oh yay - this looks like fun” to the skeptical look of people wondering why there’s a table of “kid stuff” or those with the “I’m too uncoordinated” mindset. We quickly adapt our method of engagement to meet people where they are and help shift mindset when needed. For example, one RTI employee started out doubtful, but after playing with the kendama told me “Wow, I really had to focus on it which made me forget about everything else I was worrying about. I feel better now.” Success! November 2010, I successfully completed the Nanowrimo (National Novel Writing Month) challenge of writing 50,000 words in 30 days. 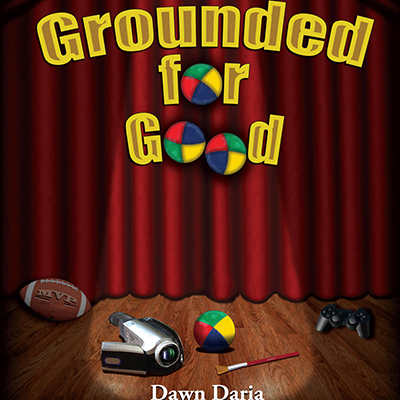 A year and a few months later and 5 years ago this month, we published Grounded for Good. It’s a story of a boy learning to juggle (of course!) More importantly, throughout the events in the story he develops a growth mindset and learns to see beyond the assumptions we often make about others. "I gave this book a five star review. The reason I did was because this book portrayed emotion and how different people can be from others and get judged. Derek reminded me of myself. Everyone in my family loves to run, play or do something with a sport, even watch sports, but I prefer studying, reading, band, being in the woods, etc. I think you should make this into a movie. I will be your director when I get out of high school. Thank you for the privilege of reading your book." We haven’t put a lot of energy into promoting the book, but happy to see it has still had an impact. We are thrilled to be partnering with George Mason University's Center for the Advancement of Well-Being for a third year. In addition to having worked with professors to create experiential learning opportunities in classes such as Foundations of Resilience and Well-Being, we will be engaging attendees at the annual Leading to Well-Being Conference being held on April 7, 2017. 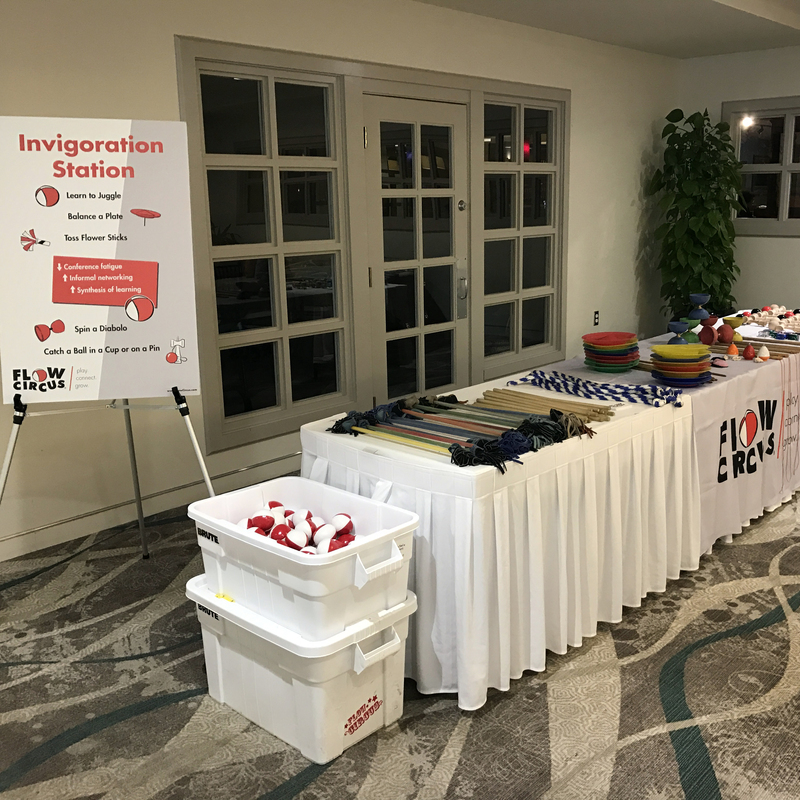 The Flow Circus Invigoration Station provides conference attendees with an opportunity to get their blood flowing, battle conference fatigue, and engage in stress-free networking while embodying the conference theme of Building Resilient Organizations in a playful way. We have been fans of Gaping Void and the artwork of Hugh MacLeod for years because they focus on themes such as culture, creativity, and connection. One of his prints hangs in our office inspiring us with: "Don't be the best in the world at what you do. Be the only one in the world who does what you do." 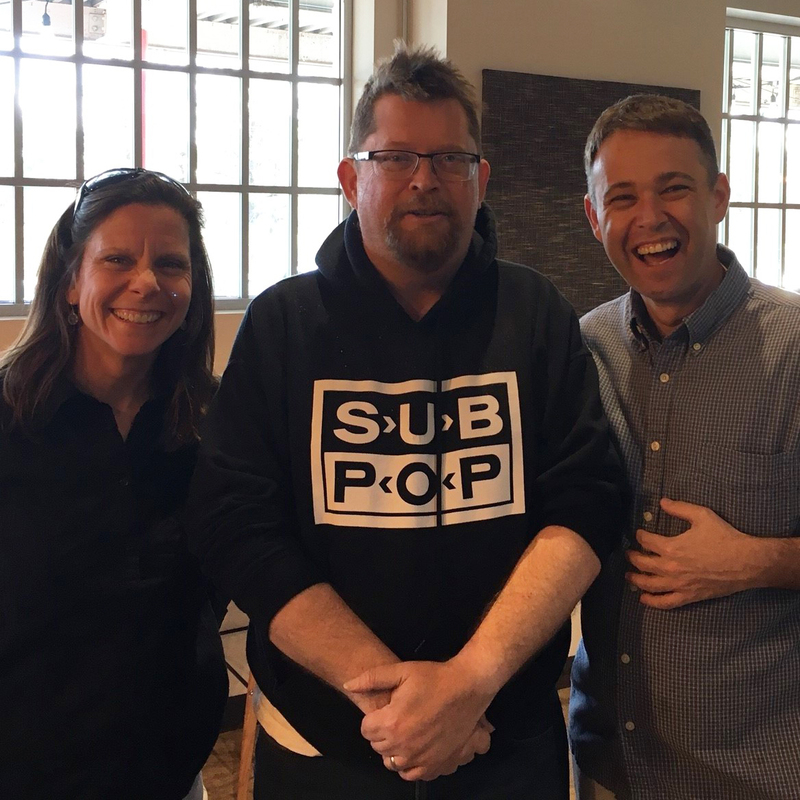 Last week, we had the opportunity to have coffee with Hugh and learn more about how he went from the NYC advertising world to blogging to co-founding a successful business with Jason Gorman. A main theme of our conversation was the importance of finding meaningful work. We're looking forward to getting together with him again and teaching him how to juggle! We're all about helping people step out of their daily routine to shift perspective and replenish. Although we prefer juggling and skill toys, there's lots of ways to step out of our comfort zones and foreign travel is a big one. 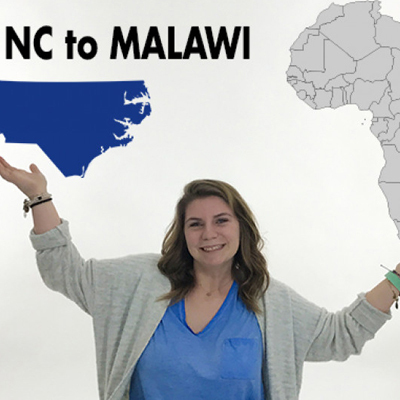 My niece recently decided to spend the summer after her freshman year at UNC Wilmington participating in a service learning trip to Malawi. Paul and I are on board to help her raise the funds she needs to get there this summer. We've helped her get a Go Fund Me page, Paul donated a performance, and we taught her how to twist balloons. I don’t know if she realized how many skills this project would teach her even before she leaves the country. I can't wait to hear stories about her trip and see how she grows from the opportunity.